The Du Val Family Scroll is really two documents attached together. 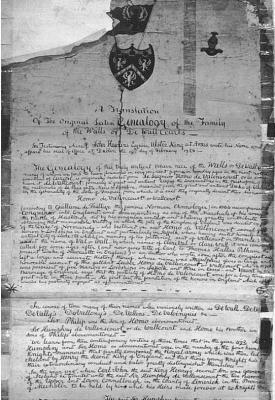 The first is a translation into English of a pedigree written in Latin in 1756 by John Hawkins, Ulster King of Arms at the College of Heralds. This ought to have been the best that could possibly have been done by such a senior authority, but in fact it contains many inaccuracies. The illustration shows the opening passage. The second document, attached to the end of the first document, is a copy made by Charles Allen Du Val in 1853 of the inscriptions in a family Bible which had belonged to his grandfather John Wall Du Val. This can safely be presumed to be accurate. (There were just a few words that he could not read, which he denotes as "imperfect".) It is a genealogy setting out the descent of his family from the Wall Family of Dunmoylan in Ireland. The scroll is now in the possession of s direct descendant of Charles Allen Du Val. The Genealogy of this truly Antient Brave race of the Walls or De WallCourt, many of whom we find to have flourished in very eminent figure in sundry ages in the most noted Countries of Europe, is originally deduced from Le Seignior Homo de Valinscourt, or as some have it de Wallcourt, formerly a great City of the Low Countries in the Bishopric of Liege the metropolis of Le Pais entre Meus & Sambre, descended from the great and antient Duke of Valors in the Generality of the Isle of France, from which it is said they originally derived their surname (2). James after the death of his Brother Richard of Dunmoylan who was wickedly murdered by Richard Stephens was thro’ fear of the said Stephens forced to fly into the County of Tipperary where he purchased the Lands of N[?] Maginstown and Kilshilane as appears from the last Will and Testament of the aforesaid James dated the 12th day of February 1533. In the troublesome times of Oliver Cromwell's usurpation a great number of eminent Families in the province of Munster brought to their plate jewels and money to the Castle of Dunmoylan thinking themselves and their effects safer than in their own houses as it was well known that the said Richard had got a grant of the great Castle from Elizabeth but instead of finding protection there they had the mortification of seeing Richard Stephens when he forcibly entered and took possession of Dunmoylan tear the grant of Queen Elizabeth before him and hearing him ask them of what use was the grant of protection then? 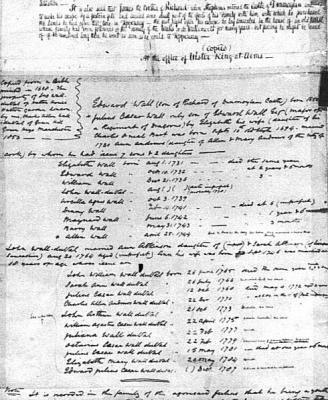 Note: It is recorded in the family of the aforesaid Julius (presumably the Julius mentioned above in paragraph 3 who married Ann Andrews in 1730) that he being a youth of extraordinary valour and martial spirit was at the tender age of 15 taken by his father the above mentioned Edward Wall into a fierce and bloody action, when the said Edward after fighting valiantly for some time fell by the hand of a cavalier, his son Julius having been previously unhorsed in the fury of battle and during the main press on, his sword still reeking with the blood of the fallen warrior, vaulted into his Father’s empty saddle and pursued with irresistible impetuosity the victor, through many vicissitudes of the fight he tracked his course with the eye of filial vengeance, till he shot him to the heart. Allen Wall left issue 2 sons, John Holwill and Allen who were both Lieutenants in the Royal Navy. John Holwill died unmarried about the year 1827. Allen married and had a numerous family. Of the children of John Wall duVal, Sarah Ann married John Edward Burgall and died without issue. John Arthur of Spa Mount, Drumcondra, near Dublin, died unmarried. William Augustus Caesar enlisted in the East India Company’s Service under the name of Waall (sic) and obtained a commission for his gallant conduct at the storming of Seringapatam and died a major, he was unmarried. Juliana died unmarried. Octavius Caesar assumed the name of Edward Octavius and married. Elizabeth Mary died unmarried. There is no account of Edward Julius Caesar, it is supposed that he died in childhood. Charles Allen Sharp Wall duVal finding his names too numerous for signature, uses of the five, viz Charles Allen DuVal or duVal by which names he is commonly known. Norris Cartali born January 27 1851". (1) The Ulster King of Arms (created in 1552) was a senior officer of the College of Heralds, the most prestigious genealogical organisation in the world. Their records are used in granting coats-of-arms and proving successors to peerages. There are currently only three such officers, Garter King of Arms, Clarenceux King of Arms, and Norrey and Ulster King of Arms. Norrey (dealing with England north of the river Trent) and Ulster (Northern Ireland) were merged in 1943. Scotland and the Irish Republic have their own officers. From 1722 until 1759 the Ulster King of Arms was (curiously and uniquely) two men, William Hawkins and his son John Hawkins of Rathfriland in County Down, Ireland. It was John Hawkins who affixed his seal of office to the Latin Du Val pedigree on 19 February 1756. (2) If "Homo de Valincourt or Wallcourt" ever existed he was not an ancestor of the Du Val family. Hubert Gallwey (The Wall Family in Ireland 1170-1970 pages 8-12) assigns the ancestry of all the Irish Wall (Du Val) families precisely to Robert Du Val who came over to England in 1066 with William the Conqueror from St Aubin-le-Guichard in Normandy. The Du Val family has no connection with Valinscourt or Wallcourt, nowadays called Walcourt, the most westerly town in the Department of Sambre et Meuse in Belgium. (3) Much is wrong with the pedigree forming the first part of the scroll. It states that the son of Homo called Sir Homo was Lord Justice of Ireland in 1199, and that he then "granted to the Archbishop of Dublin in succession for ever 20 plow lands". However from 1194 until he was sacked by King John in 1189, the Lord Justice of Ireland was actually called Hamo de Valois. When he was put in charge of Ireland, the English monarchy had no interest in Ireland, and provided no money to run the country. So Hamo de Valois proceeded to rob and plunder wherever he could. He seized the property of the Archbishop of Dublin, and the twenty plowlands mentioned were what he was eventually forced to give back. (A History of the City of Dublin by J.T. Gilbert (1854) page 103). Hamo de Valois did in fact come from an old Suffolk family. (A Political Index to the Histories of Great Britain and Ireland by R. Beatson volume 2 (1788) page 192; and The Reduction of Ireland to the Crown of England by E. Borlase (1675) page 11). But that family did not own the vast estates of the Honour of Clare. They were given by William the Conqueror to Richard FitzGilbert de Bienfaite, Count of Brionne. He was the son of a cousin of the king, and ancestor of the De Clare family. (4) The Valois surname probably evolved not into Wall but into Walsh. 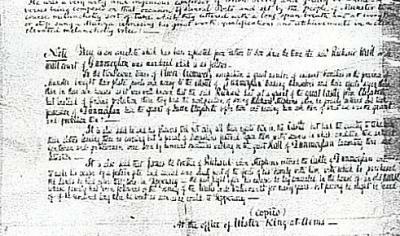 (5) The document also states that "In the year 1175 when Earl John the said King Henry’s second Son was governor of Ireland he granted unto the said Sir Humphry de Vallinscourt the two Baron[ies]of the Upper and Lower Connellough in the County of Limerick in the Province of Muster to be held by him and his Heirs male forever at 20 Knight’s Fee". And that "The said Sir Humphry having then erected a stately and well fortified Castle at a place called Dunmoylan in the Upper Connellough did there fix his Family Seat which to this day retains the antient denomination of the great Castle of the Walls of Dunmoylan". However Hamo de Valois was Lord Justice of Ireland (the king's viceroy) until 1194, not an Earl John. Nor was Henry II's second son named John - he was the fifth and youngest son, who became king in 1189. So no grant of baronies to a Sir Humphry de Vallinscourt could then have been made. (6) The genealogy which immediately follows has no relevance to the pedigree of the Du Val family descended from the Wall Family of Dunmoylan. There other errors, such as the misnaming of Stephenson as Stephens, and so on. But clearly the first part of the family scroll has to be regarded as interesting antiquarian legend, although compiled by a distinguished officer of the College of Heralds. However the detailed account of the murder and character of Richard Wall of Dunmoylan is evidently a traditional story strongly impressed on his descendants, although it relates to an event which took place in 1580 not in 1652. 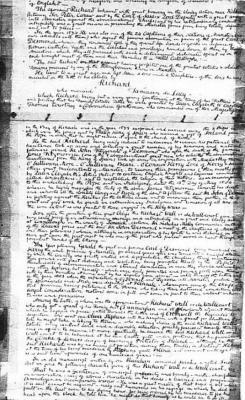 (7) The document states that "Richard being but a very young Gentleman at the time of his Father’s d[eath] and finding that his Family Estates Titles &c were granted by Queen Elizabeth to captain Thomas Courtney a Devonshire Gentleman who commanded one of Her Majesty’s [ships?] in the Bay of Kinsale and in the year 1554 surprised and carried away the 3 Ships in which were the forces sent by Philip King of Spain who received a gift of Ireland from the Pope in order that he might reduce it again to the church of Rome". 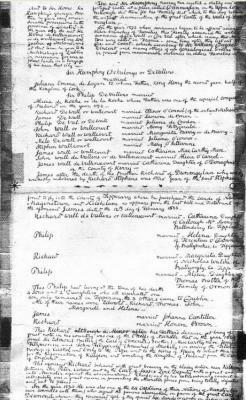 However on 8 March 1587 Queen Elizabeth granted "the fee farm of the manor of Donmullyn, in the county of Limerick" to Oliver Stephenson. (Calendar of the Patent and Close Rolls of Chancery in Ireland 1576-1602 (1862) page 159). (8) The whole of this passage in the Du Val Family Scroll appears to be out of its historical context. By 1652, the Wall family had lost their estates at Dunmoylan for ever. The savage execution of Wall of Dunmoylan had taken place in 1580.